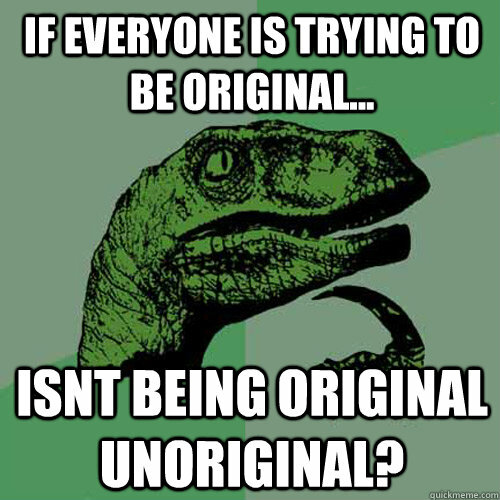 Most everyone, in some form or another, is trying to be unique, trying to be original. Especially in the worlds of blogging, media, and writing, there is a constant struggle to stand out, to be seen as fresh and new. Is it a futile battle? Consider this: every letter in the alphabet has already been used. That’s a duh, I grant you. 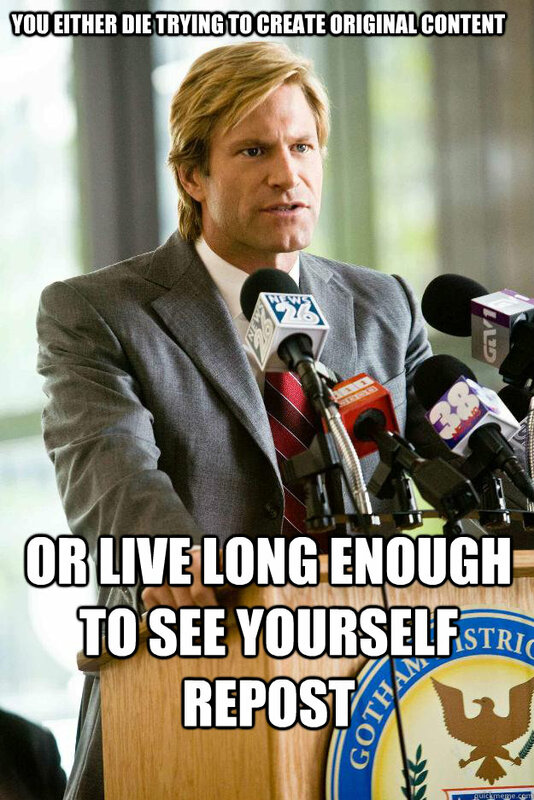 But really think about it. Every artist, every writer that impacted our civilization, from Shakespeare to Tolkien, used the same 26 letters that every nitwit on Twitter uses to update the world on what they had to eat this morning. Think about a guitar. A standard electric guitar has six strings and (usually) 23 frets. Every musician in every genre of music that utilizes the guitar, has used the same strings and the same frets as every other guitarist. I could take the analogy further, but you’re probably wondering what my point is. Every writer who wants to make their voice heard knows about the conflict of trying to stand out. We like to be thought of as fresh, exciting, original, something that no one has ever seen before. Hopeless optimists always shoot for this elusive “originality,” whilst cynics deride the idea as nonsense. “You’re unique, just like everyone else,” is what the cynics say. In my armchair studies of the world, I have determined that originality does exist, just not in the way we usually aspire to. In the world of media at least, there’s no way you can say that you’ve created something completely unlike anything else that has ever existed. There will always be some part of it that is influenced, inspired by, or affected in some way by something else. Every sentence you write, every pluck of a guitar string, has at some point been done by someone else. But that’s not a bad thing! We don’t live in a void. Even space is not as empty as common knowledge would have you believe. Our world, our universe, is one of cause and effect, action and reaction. The letters of our alphabet, the notes of music, they are just building blocks that we use to communicate ideas. It’s futile to try to be original with just the building blocks alone. The key is in how you arrange those blocks… what ideas do you convey? What emotions do you stir? What message do you share? The Ramones used electric guitars to make their music. Dark Tranquillity uses electric guitars too. The former made a few songs that I don’t mind listening to if it happens to be on, the latter used the same basic ensemble of equipment, the same fundamentals, to create something that stirred my soul, if you will, took me to another world, and helped me get through some extremely bleak and difficult times. Music may be personal taste to some, but consider the example. The fundamentals of music have not changed that much over time, yet think about how differently varying interpretations of that one idea, music, affects you. Critics and cynics are quick to deride Star Trek and Star Wars as being unoriginal. Fundamentally speaking, that may be true. Forbidden Planet was Trek before Roddenberry’s show made it to the air. Star Wars is a twentieth-century re-telling of the Hero’s Journey, and has ties that go back as far as The Iliad and The Odyssey. To that I say, so what? What matters is what Roddenberry and Lucas did with their influences. They used the building blocks of life, what they already knew, and what they wanted to see come alive, and they made it so. Their works have touched millions, nay, billions of lives. At that point, does it matter just how much of their ideas were completely theirs, something conjured in their minds and their minds alone? I say that the unwritten expectation that artists must be completely original to be “good” or to be a “true” artist is rubbish. If our universe was static, and we were gods who were responsible for the creation of all things and all ideas, yeah, maybe the expectation would be realistic. But we live in a dynamic universe that is constantly affected and affecting. We are all influenced by something at some point or another, and we all, each of us, brings a slightly different perspective to the universe. At the end of the day, it doesn’t matter what font I used, what tags I put in, or if this post gets 5 hits or 5 million. If, in using these 26 letters comprising what we call an alphabet, I have conveyed an idea to you and made you think about the concept of originality, then I have succeeded in my job as a writer. How very original of me. Disclaimer: Images pulled from http://www.google.com public image searches. The Uncommon Geek claims no ownership of the images used in this post.